The Welsh Dragon Thief Dinosaur (Dracoraptor hanigani) existed more than 200 million years ago and was a distant cousin of T rex (Tyrannosaurus rex). The skeletal fossil of this carnivorous dinosaur was uncovered by spring storms in 2014 and found by hunting brothers Rob and Nick Hanigan following a cliff fall. 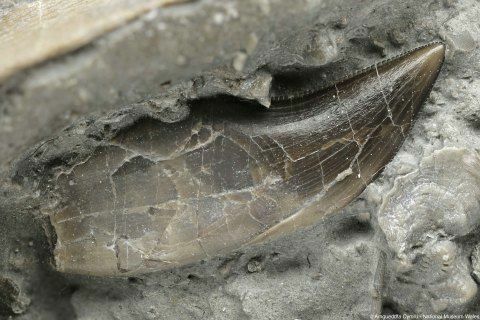 One year later, Sam Davies, who is studying palaeontology at the University of Portsmouth, came across a fossilised foot during a field trip, at exactly the same location – a beach near Penarth in the Vale of Glamorgan in south Wales. A group of palaeontologists from the University of Portsmouth, the University of Manchester, and the National Museum Wales, wrote about their find in the scientific journal PLOS ONE. Dr. David M. Martill, from the School of Earth and Environmental Sciences at the University of Portsmouth, and colleagues believe Dacoraptor is a very distant cousin of T. Rex and existed over 200 million years ago. The fossils, that included a foot, skull, teeth and claws, were donated to the National Museum Wales by the brothers. The specimens were found spread across five slabs of rock. While most of them were preserved in the correct position, some had been moved about by scavengers, including fish and sea-urchins. Experts noticed that most of the bones appeared not to be fully formed, suggesting that this Dragon Thief was a juvenile. Sam Davies’ chance discovery of the fossilised foot would not have happened had he arrived at the spot later. The specimen had been found on top of a slab of rock, and would have been washed away by the River Severn’s tide current. For Welsh paleontologists, this is a major find. It is the first skeleton of a theropod dinosaur ever found in the country. According to the University of California Museum of Paleontology, the theropod (meaning ‘beast-footed’) dinosaurs are a diverse group of two-footed saurischian dinosaurs. They include the biggest terrestrial carnivores ever to walk the Earth, including T. rex. Birds are descendants of non-flying theropods. Previous Welsh finds have occurred, but only consisted of isolated teeth and bones unearthed in the south near Cowbridge, Bridgend and Penarth. 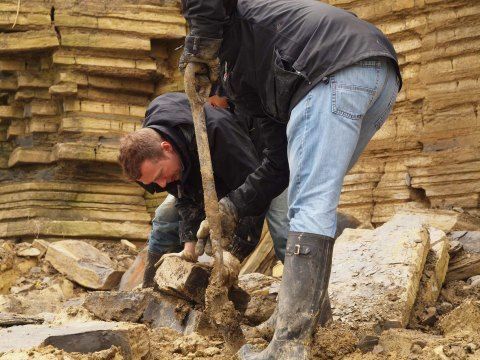 A dinosaur footprint site near Barry is one of the oldest in Europe, dating back to 215 million years ago. Reference: “The Oldest Jurassic Dinosaur: A Basal Neotheropod from the Hettangian of Great Britain,” David M. Martill, John R. Nudds, Steven U. Vidovic and Cindy Howells. PLOS ONE. 20 January, 2016. DOI: 10.1371/journal.pone.0145713. Dr. Dave Martill, with his palaeontology student Sam Davies, talk about the Dragon Thief (Dracoraptor hanigani).